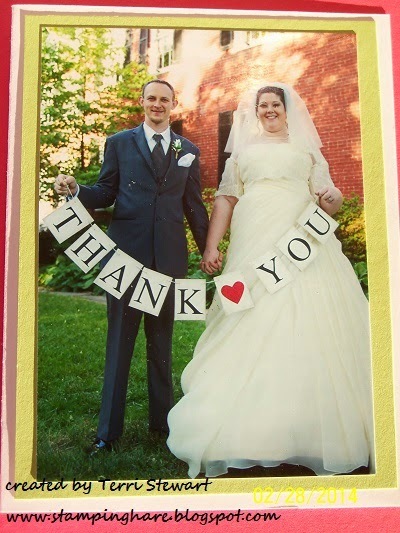 I purchased a box of thank you cards on sale, cut a cardstock mat (which coordinated with the green colors in the photo) for the photo, and adhered that piece to the front of the cards. 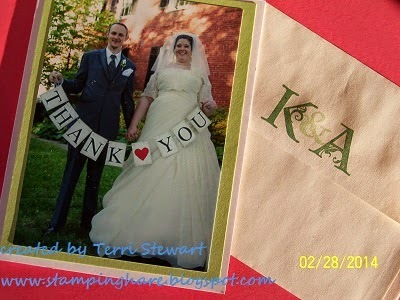 Of course, I had to stamp something, so I stamped their initials on the back side of the envelopes. Guess what time it is......it's Sale-a-Bration time!!!! FREE! For every $50 you spend (before tax and shipping), you get a FREE Sale-A-Bration product. That means it's the perfect time to purchase those products you've had on your wish while earning getting products for free. A few of the stamps and DSP (see Pages 16-19) are limited-time products available only until February 15. Don't miss out on these, place your SAB order today! 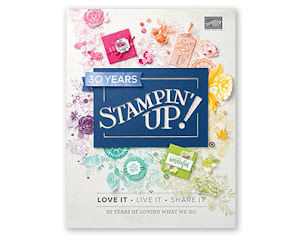 Join my Team It's the best time of year to join Stampin' Up! During Sale-A-Bration, you can join my team to become a demonstrator for just $99 and get to select $155 in products! Plus, the kit ships for free! Absolutely no obligation to hold parties, classes, etc if you don't want to. But wait there's more! I love a bargain and this is fabulous bargain -- Host your own Stampin Up party and save even more by using your hostess benefit dollars toward the $99 kit fee! Check out this amazing opportunity: place a $150 order, select 3 free SAB items, apply your $15 hostess benefit dollars toward the kit fee (bringing the cost down to $84), then select another $155 in products, for a total value of $305 (plus your 3 FREE SAB items) only paying $234!!! And did I mention no obligation to sell anything?! Interested? Give me a call today. February 4th, Thursday, 7-9pm, make Valentine cards (or use birthday/friendship sentiment), 1 each of 4 designs; tuition is $10 or free with a minimum order. RSVP ASAP! As a nod to Throwback Thursday, I'll have a small buffet of Valentine cards (2-3 samples) from previous years, that you can make a la cart for $2 each. February 5th repeat of above class, Friday, 6-9pm, make Valentine cards (or use birthday/friendship sentiment), 1 each of 4 designs; tuition is $10 or free with a minimum order. RSVP today Buffet leftovers, if available, you can make a la cart for $2 each. Choose me as your Stampin Up demo when you subscribe (or use the link below to automatically select me) and you get a free crafting night every month. Bring your kit to my house and get your pumpkin on! Pumpkin kit night is held at the end of the month, 7-9pm; the upcoming Pumpkin nights are January 29th, February 29th, and March 29th. Click here to subscribe (links to me) and join the fun. But wait, there are more perks for subscribing! Only kit subscribers can purchase kit refills and additional kits (while supplies last). Sign up today! Or take advantage of the SAB Pumpkin kit special---purchase a prepaid 3 month subscription on sale for just $55 and receive 3 monthly kits PLUS pick a FREE SAB item. Win-win! New weekly deals! These items are on sale through midnight Monday, February 8th. New items revealed every Tuesday. Click here to go to my online store.